For other uses, see Falstaff (disambiguation). 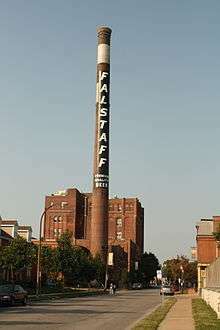 Falstaff Brewing's earliest form was as the Lemp Brewery, founded in 1840 in St. Louis by German immigrant Johann Adam Lemp (1798-1862). Over the next 80 years, the Lemp family was devastated by personal tragedies as it built its beer empire over the caves of St. Louis. It adopted its famous "Blue Ribbon" moniker quickly, as an 1898 trial proved when it took the Storz Brewing Company of Omaha to court for tying blue ribbons on its bottles, and won. The Lemp Brewery company closed in 1921, and sold its Falstaff brand to the then-named Griesedieck Beverage Company. Griesedieck Beverage was renamed the Falstaff Corporation and survived Prohibition by selling near beer, soft drinks, and cured hams under the Falstaff name. Falstaff Brewing was a publicly traded company on the New York Stock Exchange, which was rare for a brewing industry in which families closely guarded their ownership. The Falstaff Brewery located in the north side of St. Louis. Fortunes declined throughout the 1970s as consolidation swept the beer industry, and the company was bought in April 1975 by the S&P Company, owned by Paul Kalmanovitz. In the interim, Chicago White Sox announcer Harry Caray endorsed the brew in live TV commercials, many times with a glass of beer in his hand and sipping it. Kalmanovitz also owns General Brewing, Pabst, Pearl, Olympia, and Stroh's. That year, the company ranked 11th in sales nationally, and the original St. Louis plant was closed. Subsequent closures included New Orleans in 1979, Cranston and Galveston in 1981, and Omaha in 1987. 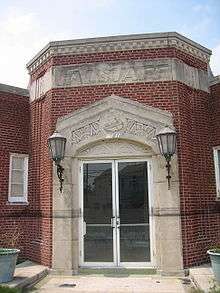 After the 1990 closing of the last Falstaff brewery in Fort Wayne, the brand name became a licensed property of Pabst, which continued to produce Falstaff Beer through other breweries. Having sold only 1468 barrels of the brand during 2004, Pabst discontinued production of the Falstaff label in May 2005. Sheryl Crow mentions Falstaff beer in her song "A Change." Crow writes, "He's a platinum canary, drinkin' Falstaff beer. Mercedes Ruehl and a rented Lear." Ray Wylie Hubbard mentions Falstaff beer in his song "Redneck Mother." Hubbard writes, "Kickin' hippies' asses and raisin' hell, sure does like his Falstaff Beer." Robert Crais has his Det. Elvis Cole buying a case off E Bay in his latest book "The Promise". The British psychedelic rock group Cream performed a radio commercial for the beer that was released as part of a box set compilation "Those were the days." In Chapter 11 of Toni Morrison's "Song of Solomon," characters "opened some Falstaff beer and began to talk about guns" (271) of the 2004 First Vintage Edition. In the opening late night beach scene of the movie Jaws (film), partiers are drinking Falstaff beer from plastic cups before Chrissie runs off to swim and be eaten. ↑ Yenne, B. (2004) Great American Beers: Twelve Brands That Became Icons. Motorbooks International. p 41. 1 2 "Falstaff Brewing Corporation", Retrieved 4/1/2008. ↑ Yenne, B. (2004) p 106. 1 2 3 Tremblay, V.J. (2005) The U.S. Brewing Industry: Data and Economic Analysis. MIT Press. p. 96. 1 2 3 Mittleman, A. Brewing Battles: History of American Beer. Algora Publishing. p 110. ↑ "A New Home for the Museum". Retrieved 2011-09-16. ↑ "United States, Appellant, v. Falstaff Brewing Corporation et al.". 410 U.S. 526 (93 S.Ct. 1096, 35 L.Ed.2d 475). Legal Information Institute. Retrieved 2015-02-23. ↑ Yenne, B. (2004) p 45. ↑ Falstaff Brewing fansite Retrieved 4/1/2008. ↑ "History of brewing in St. Louis", Schlafly Beer. Retrieved 4/1/2008.